One man who has over time become an integral part of the New England Patriots’ Defense department is no other than the evolved and talented Kyle Van Noy. The linebacker of the NFL franchise was originally drafted in the second round of the 2014 National Football League (NFL) Draft by the Detroit Lions, where he mined his trade for two years before he was traded to the Patriots took him in 2017. The No. 53 man was a part of the Patriots team that won the Super Bowl LIII Championship in 2019 which saw his team become joint highest holders (six times in eleven attempts) of the coveted NFL trophy alongside the Pittsburgh Steelers, thus, invariably earning for himself a second Super Bowl title. Initially, Van Noy did not only played football as he was also good in baseball, basketball and even ran the tracks, no wonder he got varsity sports scholarship from BYU where his exploits with the Cougars team won him many accolades. Born and named Kyle Van Noy on March 26, 1991, in Reno, Nevada but raised in California by his adoptive parents, he was raised alongside his older brother – Travis Van Noy. His football talents were discovered when he was only 8 years old and he later was admitted to Robert McQueen High School where his skills came to the fore. He participated actively in four sports namely; basketball, baseball, tracks and especially the football where he helped his high school team clinch a 14 – 0 record during the 4A State Championship which they won in 2008 before he moved on to the college. His high school excellent performance in sports saw him lettered then ranked as a 2-star recruit by the renown sports sites Scout.com and Rival.com and also made many colleges to scout for his services for which he finally signed up a football scholarship with the Brigham Young University, a private university. His days with the Cougars’ football team saw him miss his first year of football as a result of a misdemeanor but he eventually played every of the next season (2010) and made 35 tackles (24 solo), 7.5 tackles-for-loss including 2.0 sacks. He improved that run in his sophomore season with 68 tackles, 7 sacks and 3 interceptions that earned him FBS All-Independent team mention, Phil Steele All-Independent First Team as well as Yahoo Sports All-Independent Team. He ended his varsity football with 226 tackles in all 52 games played winning the All-Independent Defensive Player of Year award for the third time while he got named as All-American Third team for the second time among many other awards. With a lot of accolade for the superlative job done in his college football career, he declared for the 2014 NFL draft and that saw him drafted by the Detroit Lions in the second round as a 40th pick after the combine. He inked a 4-year contract deal worth $5.10 million and spent three seasons with them, playing in 30 games in all with a record of 32 solo tackles and 4 assists and 1.0 sack. The talented football star was signed on by the New England Patriots in 2016 but he started playing in 2017 and luckily for him was part of the squad’s victory at the Super Bowl LI, thus, winning his first-ever Super Bowl title. Fast forward to February 2019, history repeated itself as he joined his team again at the Super Bowl LIII trashing the Rams 13-3 with his contribution of 3 tackles, 1 sack and a tackle for loss. The two-time Super Bowl champion, Kyle Van Noy, has no doubt amassed a fortune via the game of football in the past 5 years in the NFL and he is probably among the big earners in the league. He inked a 2-year contract sum worth $11.7 with a sign-on bonus of $3.5 million and of course a guaranteed sum of $5.5 million. His base salary is estimated to be well between $2 million to 4.3 million, with a roster bonus of $500,000 and his cap hit is pegged at $5.9 million in all. Kyle Van Noy is one of the few individuals who despite being adopted is pulling his weight while doing excellently well in life. He was said to have been adopted at birth after his birth mother willingly gave him up to the Latter Day Saints Family services (LDS). His birth mother’s fascination with the way of life of the LDS was what led to her decision to give up her child so that he would have that kind of life. He was later adopted by the lovely couple Kelly and Layne Van Noy who took him back to California with them, raising him as their own second son. They saw the best in him and encouraged him to build his dreams in the American football league which has paid off now. Behind every successful man is a woman and the saying is true for the star athlete who is married to a former beauty queen, Marissa Powell. The lovebird consummated their union in matrimony in 2014 after three years of courtship at the Church of Jesus Christ of Latter Day Saint, Salt Lake City. Marissa Powell had her education at Westminster College and as a sports lover, she actively played Volleyball with her school team. 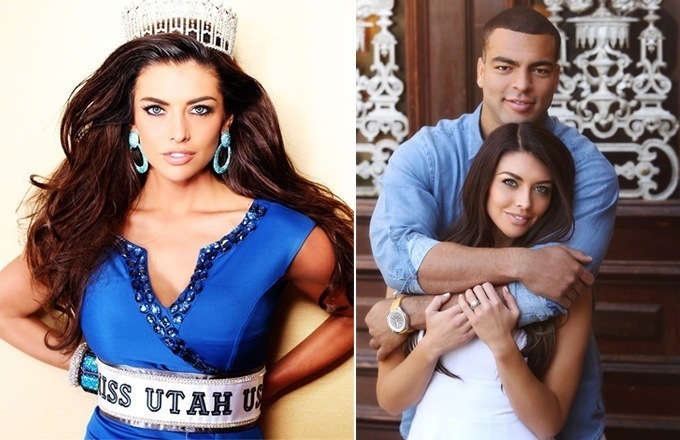 She represented Utah in the Miss USA beauty pageant after she won the local pageant to emerge as Miss Utah, USA in 2013. She is also an actress and was featured in What Would You Do? a television series which aired on ABC while gracing many fitness magazines. The couple does not have kids yet but they have a foundation – Van Noy Valor Foundation – where they reach out to disadvantaged kids in shelters giving them best help as possible. The Reno-born NFL footballer is one of the fine men in the trade and a hulk. He stands tall at a height measured at of 6 feet 3 inches (1.91 m) while his big frame is held up by a weight of 113 kilograms (250 lb).